As GSD owners and also as dog trainers we believe the GSD is the most versatile breed of dog available, being suitable as a family pet, working dog, companion, show dog, endurance partner, obedience dog and used by the many fields of law enforcement around the world. Each one of our GSDs have fantastic temperaments being truly loyal, caring, friendly and also highly intelligent. This has been achieved by correctly socialising and training the dogs from a young age. Every Derharv puppy is socialised accordingly to give the best foundation for a happy, well rounded adult dog with the help of further training. There seems to be this perception that the GSD is something to be feared by the unknown, in my experience I find this is certainly not the case. GSDs are the same as any other breed, brought up in the right way they are truly fantastic animals. 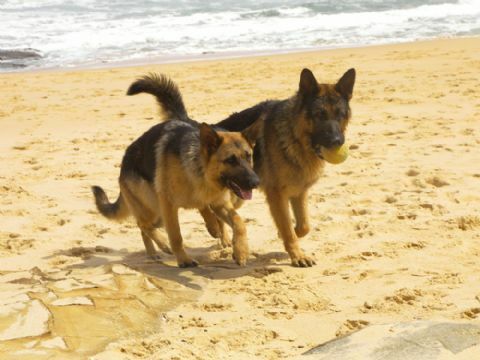 The right socialisation and training of a GSD as a puppy and adult dictates its path for its future. Any dog in the wrong hands has a very real potential to be aggressive, fearful or boisterous. When you buy a Derharv German Shepherd Dog you will be given advice on how to raise a happy, well rounded dog. We can give you ongoing support with any training or behavioural issues that may arise as your dog grows and adjusts to its new home and family. The German Shepherd Dog was officially recognised as a breed in 1899. Up until this time there had been many variations of shepherding dogs throughout Europe but no standards of any sort. In different countries, the shepherding dogs would have different traits - longer coats where the climate was colder, larger in size and more powerful where there were higher numbers of predatory animals, etc. Captain Max von Stephanitz had an interest in the shepherding dogs at this time but had yet to find one that matched his ideals. It was in 1899 at a show that he finally came across Hektor Linksrhein a dog that Von Stephanitz was so impressed with that he purchased him on the spot. This dog was to become the first German Shepherd Dogand was renamed Horand v Grafeth. It is also at this time that Von Stephanitz formed a society called Verein fur deutsche Schaferhunde or SV to maintain the high standard of the breed. The main traits that Von Stephanitz looked for in his dogs were intelligence and their ability to work. Horand was highly sought after for breeding purposes and sired many litters. At this time there was a lot of necessary inbreeding to strengthen the traits in the breed that Von Stephanitz valued. As time passed, society's uses for dogs began to change. Herding skills weren't as necessary in a dog, but adaptability was. A dog that could do any task would prove to be very useful. Von Stephanitz saw this and started to steer the breed accordingly. In the World War I GSDs were used as messengers, as rescue dogs, sentries and guard dogs. This increased their popularity outside of Europe as servicemen from overseas were suitably impressed with the breed. There were concerns that the name of the breed would deter people as it had the word 'German' in it, so the breed was renamed 'Alsation Wolf Dog' and later simply 'Alsation'. In 1977, thanks to many campaigns by breeders, the name of the breed was changed back German Shepherd Dog. Nowadays the breed is extremely versatile being used as family pets, seeing eye dogs, sniffer dogs, search and rescue dogs, guard dogs, police dogs, herding dogs and more. They also have the intellect to be highly trained in obedience, the agility to enter agility competitions and the devotion to be a faithful, loving pet.